Continence, lower urinary tract (LUTS) and bowel symptoms are part of daily life for millions of people across the UK. This report is based on a Freedom of Information request which was sent to every PCT in England to uncover new data about the way that LUTS and continence services are commissioned. Devices for Dignity (D4D), a healthcare technology co-operative, has won a major national award for its pioneering work in delivering technological solutions to support people with long term conditions. D4D won the Allied Health Professionals and Healthcare Scientists: Leading Together On Health Award at the 2012 Advancing Healthcare Awards (organised by Chamberlain Dunn) at a celebration lunch at the Radisson Blu Portman Square Hotel in London. 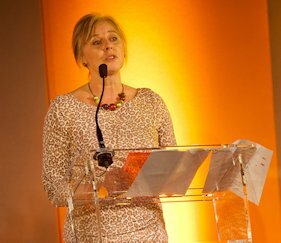 The award, sponsored by Unite the Union, was presented to D4D’s clinical director Professor Wendy Tindale by BBC medical correspondent Fergus Walsh. D4D is a clinician-led formal collaboration between clinicians, patients, academics and industry, to address areas of unmet clinical need where innovations in treatments and technologies have the potential to make a huge impact by both reducing morbidity and improving quality of life. The collaboration is focused on three key areas: assistive technology, urinary continence management and renal technology. It includes an online capability for people to suggest new ideas and currently runs a portfolio of 25 projects predicted to save the NHS £70million. Professor Wendy Tindale said: “We’re absolutely delighted to be recognised for all of the hard work, skill and vision that have contributed to making D4D such a success. Devices for Dignity (D4D) works with industry, along with inventors and clinicians and healthcare professionals who have ideas for medical devices that meet real clinical need. An exciting invention which was led by Martin Johnson in its development featured a technology which needed clinical guidance make suitable for renal patients. The product is a simple home haemodialysis machine that’s easy to use, needs no cleaning and can be easily transported. The innovation was inspired by learning about problems associated with current renal treatment using complex machines in hospital and looking at how other non-medical products have been made easy to use at home. Martin’s team were experienced in developing machines in other markets which were more advanced in design yet smaller and simpler to operate than the current machinery on the market. They were surprised to find that dialysis technology had seen little change in 30 years. “Technology transfer across markets enables reliable proven ideas to be adapted faster with fewer risks” says Martin, who founded Quanta Fluid Solutions Ltd to develop its unique haemodialysis machine. Martin was referred to D4D when it was first set up in 2008. “We needed greater knowledge about patient and clinical needs. I’d been working with Dr Elizabeth Lindley, who’s now a D4D renal specialist,” he says. Most patients who rely on haemodialysis as a treatment for kidney failure have to visit a hospital three times a week to undergo their treatment. With each treatment lasting approximately four hours – with additional time to set up dialysis machines – it’s an incredibly disruptive process for patients and labour intensive and costly for the NHS. The Quanta machine, which is under development, will enable patients to dialyse themselves at home without the need for nursing help . The simplicity of the controls will encourage more patients to take control of their treatment and will allow longer and/or more frequent treatment which in turn should have a positive impact on their general level of health and wellbeing. To encourage patients to use a machine at home, it was important that it was operated like a domestic appliance , had an attractive design and was portable to enable patients to travel anywhere with confidence . Martin believes the D4D initiative to be invaluable for bringing industry professionals together with those at the coal face. “Industry need regular contact with clinicians to ensure the products we’re developing are meeting a real need medically, but are also in line with what health professionals and patients want,” he says. Through D4D Martin attended an NHS Innovation Conference in London in June 2009, where the haemodialysis unit attracted the attention of NHS Chief Executive David Nicholson. “Meeting David Nicholson, and hearing him endorsing what we’re doing is fantastic,” says David. If you’ve got an idea or an invention you’d like to discuss with us, please contact us. People with neck weaknesses as a result of neurological diseases are set to benefit from improved designs of neck supports thanks to a new collaborative D4D project. D4D, SITraN and Sheffield Hallam University have received an NIHR Invention for Innovation (i4i) grant for the development of a novel neck-collar. The need for this project was initially proposed by the DeNDRoN Clinical Studies Group for motor neurone disease, with support from carers and patients, who approached D4D with the view that current neck collars are inadequate in terms of function, comfort and cosmesis. The project originated as one of three case studies used in the D4D/KT EQUAL funded design workshop in July 2010. The new project will start in April 2012. D4D and the University of Leeds have been awarded £356,000 by the NIHR Invention for Innovation early stage scheme to develop new flushable sustainable devices for active continence management. The project is funded for two years and will build on previous research undertaken by the Leeds Centre for Technical Textiles research group to develop systems to actively manage the liquid contents of continence devices to prevent spillages and aid disposal. The Bladder and Bowel Foundation, the UKs largest bladder and bowl charity will be supporting and advising on the project to ensure that any new products meet user needs. D4D has been awarded a further £600k of funding from the Department of Heath, to support delivery of its programme of work in stimulating inventive and innovative solutions in areas of healthcare underserved by technology. Focusing on core D4D themes (Assistive Technology, Renal Technology and Urinary Continence Management), the funding will enable D4D to continue its commitment to developing successful innovations. Further details of this exciting project will appear soon on the D4D website. £30,000 of funding has been awarded to two teams of innovative healthcare professionals in a proof of concept competition designed to drive the development of life changing products. In August, Devices for Dignity (D4D) – the organisation that delivers technology solutions to support people with long-term conditions preserving their dignity and independence, identified unmet clinical needs in two major areas of healthcare and ran a competition inviting anybody in the sector to apply for funding and support to turn innovative ideas into commercial realities. The winning teams led by Mr Gareth Adkins & Dr Nicholas Fardon, will be awarded £15,000 each to advance the developments of a specific product in their specialist area of healthcare. 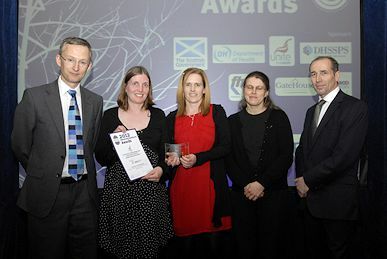 In the Assistive Technology category, consultant clinical scientist Gareth Adkins was selected as the winner. Gareth works as the Head of Rehabilitation Engineering at Morriston Hospital in Swansea and his team was awarded the funding to develop an Electromyography (EMG) stand alone switch to improve user experience, accessibility and independence. An EMG or muscle action switch enables severely disabled users to independently control their environment or access communication with tiny muscle actions, sometimes their only reliable movement. Usually these switches require powerful computers but this project intends to create a switch that can work independently of other equipment. Gareth said: “We are delighted. The unique group we have brought together includes medical electronics specialists, rehabilitation engineers and designers from the National Centre for Product Design and Development Research (PDR) Medical Applications Group at Cardiff Metropolitan University. In the Renal Technologies category funding was awarded to Consultant Nephrologist, Dr Nicholas Fardon and Dr Prashant Verma alongside teams from Sheffield Teaching Hospitals NHS Foundation Trust. They will work on the development of a simple battery powered ultrasound scanner optimised for viewing fistulae (expanded veins used for wide bore kidney dialysis needles). Two solutions were offered, the first to modify a scanner that is currently used in the veterinary field; the second is to evaluate the use of transillumination. The team will work with the Sheffield Kidney Institute to compare the two potential solutions. The technology that shows the greatest promise will be modified as required and trialled by specialist dialysis nurses. Feedback from the trials will be used to finalise the design of the prototype device. With proof of concept, it is hoped that an industrial partner will be found to commercialise the real-time fistula localisation device. The winners will have the opportunity to work with D4D and gain access to the D4D national expert networks, resources and specialist clinicians throughout the process. This new video from the Ambient Assisted Living (AAL) Joint Programme explains the mission and the main goals of the European programme for active and healthy ageing. REALISE is a new website that aims to radically change the lives of people struggling to use the internet, computers and mobile technology. Providing an online collaborative workspace, REALISE is a website where anybody can positively impact lives. REALISE, the next evolution in collaborative working, will be launched at two events, RaATE in Coventry on 28th November and the KT-Equal event ‘Taming the Dragon; making technology work for us‘ in Chelmsford on 29th November. RaATE is the only UK conference focused on the latest innovations of Assistive Technology and the KT-Equal events focus on innovation for older people. REALISE works by inviting anyone to submit ideas on how to make technology easier to use for all. These ideas are then openly discussed, helping to gain a consensus and move to an ‘incubation’ stage . In the incubation stage a lead group or individual can attempt to establish a fully fledged assistive technology project. Projects developed so far include ATbar, a toolbar that can be added to any website allowing text to be read out loud, and forms to be spell checked for mistakes.